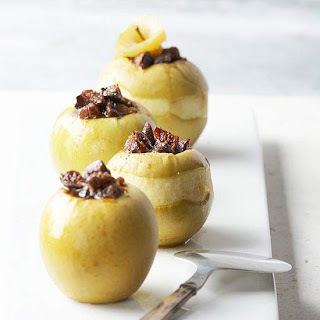 Stuffed Apples ~ Instead of baking this classic dessert, call the ever-handy slow cooker to action. Play with the mix of spices and fruit until you find the combo your family likes best. 1. Core apples; cut a strip of peel from the top of each apple. Place apples, top sides up, in a 3-1/2- or 4-quart slow cooker.2. In a small bowl combine figs, brown sugar, and apple pie spice. Spoon mixture into centers of apples, patting in with a knife or narrow metal spatula. Pour apple juice around apples in cooker. Top each apple with a piece of butter.3. Cover and cook on low-heat setting for 5 hours or on high-heat setting for 2-1/2 hours.4. 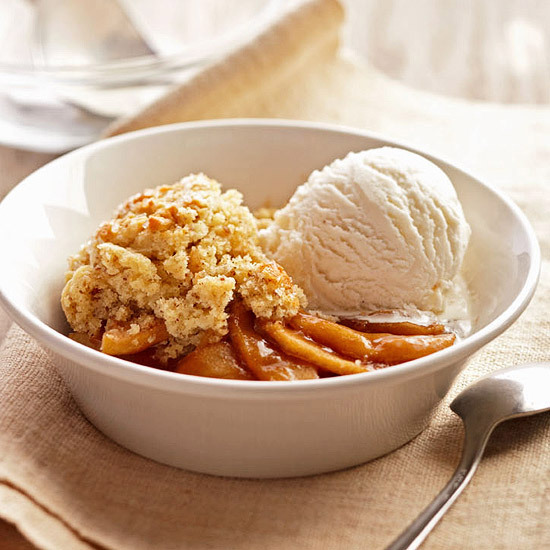 Using a large spoon, transfer apples to dessert dishes. Spoon some of the cooking liquid over apples. Serve warm. 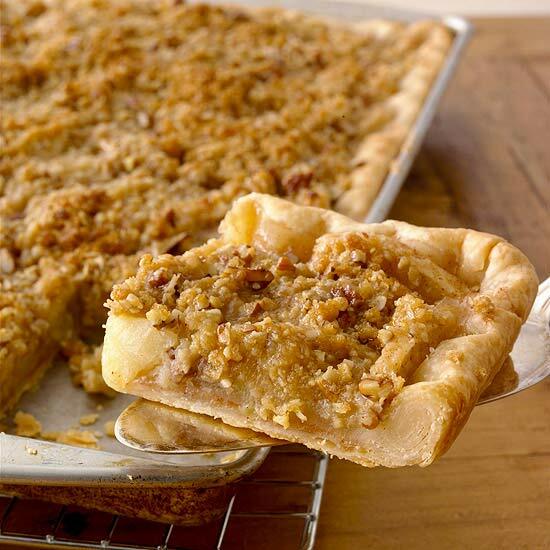 Granny Smith Cobbler with White Cheddar Biscuits ~ Inspired by cheddar cheese-topped apple pie, this warm and crumbly dessert is spiced with cinnamon and topped with savory biscuits. 1. Preheat oven to 400 degrees F. In a 4- to 6-quart Dutch oven combine apple slices, brown sugar, balsamic vinegar, and cinnamon. Bring to boiling, stirring occasionally once apples begin to release their juices; reduce heat. Simmer, covered, about 5 minutes or until apples are nearly tender, stirring occasionally. In a small bowl stir together the cold water and cornstarch; add to apple mixture. Cook and stir until thickened and bubbly. Keep hot over low heat.2. In a large bowl combine flour, ground nuts, granulated sugar, baking powder, and salt. Using a pastry blender, cut in butter until pieces are pea size. In a medium bowl stir together eggs, milk, and cheese. Add cheese mixture to flour mixture; stir just until combined. Spoon hot apple mixture evenly into a 3-quart rectangular baking dish. Using a spoon, drop dough mixture into 12 mounds on top of fruit.3. Bake in the preheated oven for 25 to 30 minutes or until top is golden and filling is bubbly. Cool on a wire rack for 30 minutes. Serve warm. If desired, serve with ice cream. 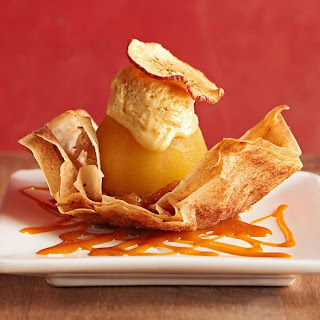 Poached Apple Strudel ~ Graham cracker ice cream, warm caramel sauce, and crisp apple chips top poached apples nestled in phyllo cups. It's a beautiful and delicious dessert. 1. For graham cracker ice cream, in a large saucepan combine milk and cream; bring to boiling. Stir in crumbled graham crackers. Remove from heat. Cover and let stand at room temperature for 2 hours (do not let stand any longer). Strain through a fine-mesh strainer. Return strained mixture to saucepan. Return just to boiling, watching carefully to prevent sticking. In a medium bowl whisk together 1 cup sugar and the egg yolks. Pour a little of the hot milk mixture into the yolk mixture, whisking constantly to combine; return all to the saucepan. Cook about 30 seconds or until thickened and bubbly, stirring constantly. Place saucepan in a large bowl of ice water and stir until chilled. Transfer mixture to a large bowl. Cover and chill for 4 to 24 hours. Freeze chilled mixture in an ice cream freezer according to manufacturer's directions. If desired, ripen for at least 4 hours.**2. For poached apples, in a large saucepan combine 1 cup sugar and the water, stirring until mixture looks like wet sand. Cook and stir over high heat until lightly golden (sugar may appear lumpy but will smooth out as it heats). Add wine, orange peel, star anise, and cinnamon stick. Be careful not to let the mixture splash out of the saucepan. Bring to boiling over medium heat; reduce heat to low. Add apples; weight down with a heatproof plate to make sure apples are completely covered by the liquid. (If more liquid is needed, add a small amount of apple juice or water.) Simmer, uncovered, for 20 to 25 minutes or until apples are tender. Using a slotted spoon, remove apples from liquid; cool slightly. Serve warm.3. For phyllo cups, preheat oven to 350 degrees F. On a shallow baking pan arrange four 6-ounce custard cups, bottom sides up. Lightly coat cups with cooking spray. On a clean work surface, stack phyllo sheets on top of one another, brushing each sheet with melted butter and sprinkling cinnamon sugar between layers. Cut stack crosswise to make two rectangles (each 9x7 inches); cut in half crosswise again to make four rectangles total (each 7x4 1/2 inches). Lay each rectangle over the back of a prepared custard cup. Bake in the preheated oven about 12 minutes or until golden. Carefully remove phyllo from custard cups. Cool completely on a wire rack.4. To assemble, drizzle half of the Caramel Sauce onto four dessert plates. Place a phyllo cup on each plate. Spoon 1 tablespoon of the Homemade Applesauce and 1 tablespoon of the remaining Caramel Sauce in the bottom of each phyllo cup. 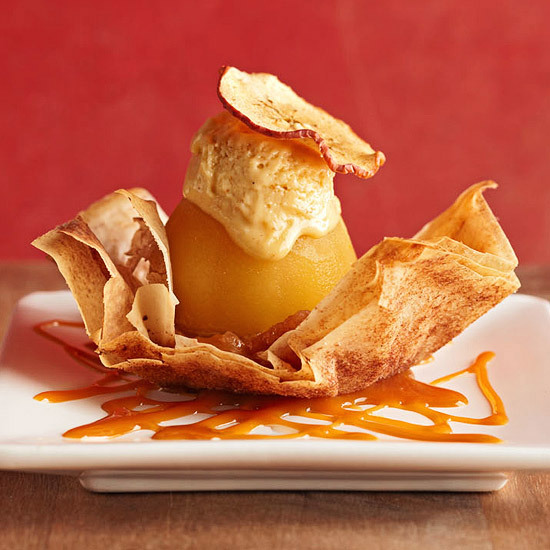 Place a poached apple in each phyllo cup. Top each with a scoop of the graham cracker ice cream. If desired, garnish with Apple Chips. Crumb-Topped Apple Slab Pie ~ One of the most popular recipes on Pinterest, this apple slab pie features from-scratch crumb topping with crunchy rolled oats and finely chopped pecans. Pin it to your boards today! 1. Line a 15x10x1-inch baking pan with 18-inch-wide foil, extending the foil up over the edges of the pan; set aside. For dough: In a large bowl, stir together the 2-1/4 cups flour and the salt. Using a pastry blender, cut in shortening until mixture resembles coarse crumbs. Sprinkle 1 tablespoon of the cold water over part of the flour mixture; gently toss with a fork. Push moistened dough to side of bowl. Repeat, using 1 tablespoon cold water at a time, until all of the flour mixture is moistened. Using your fingers, gently knead the dough just until a ball forms.2. Preheat oven to 375F. On a lightly floured surface, roll dough into a 19x13-inch rectangle. Wrap it around the rolling pin; unroll it into the prepared baking pan. Ease dough into the pan and up the sides, being careful not to stretch it. Trim dough to 1/2 inch beyond edge of pan. Fold dough edge over and flute as desired.3. In an extra-large bowl, combine sugar, the 1/3 cup flour, and the cinnamon; add apples. Toss lightly until apples are coated. Spoon apple mixture into dough-lined pan; spread evenly. Sprinkle with Crumb Topping (pan will be full).4. Bake for 40 to 45 minutes or until apples are tender. If necessary to prevent overbrowning, cover top with foil for the last 5 to 10 minutes of baking. Cool slightly in pan on a wire rack.5. Serve warm or cool completely. Cut into rectangles. Makes 25 servings. Apple Whoopie Pies ~ Billowy marshmallow filling is sandwiched between cakey applesauce-spice cookies for a fun-to-eat, portable dessert. 1. Preheat oven to 350 degrees F. Line a large cookie sheet with parchment paper; set aside. In a large bowl combine brown sugar and butter. Beat with an electric mixer on medium speed until fluffy. Add eggs and vanilla; beat until combined. Add Homemade Applesauce and whipping cream; beat well. In a medium bowl combine flour, cinnamon, baking powder, baking soda, and salt. Gradually add flour mixture to the beaten mixture, beating until well mixed.2. Drop batter by spoonfuls about 2 inches apart onto prepared cookie sheet. Bake in the preheated oven for 10 to 12 minutes or until edges are light brown. Transfer to a wire rack; cool.3. Spread Fluffy Filling on bottoms of half of the cooled cookies. Top with the remaining cookies, bottom sides down. Serve immediately or store in the refrigerator and serve within 24 hours. If desired, garnish with apple peel ribbons. 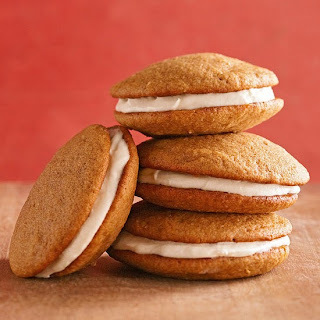 Fluffy Filling: In a medium bowl combine 1 cup butter, softened; 1/2 cup marshmallow creme; 1/4 cup whole milk; 1/4 cup all-purpose flour; and 1 teaspoon vanilla. Beat with an electric mixer on medium speed until well mixed. Gradually add 4 cups powdered sugar, 1 cup at a time, beating until well mixed and fluffy. Makes about 2 2/3 cups.